Dr. Reis talks about the main trends in longevity research, potential for creation life extension therapies in the nearest future, his favorite genes, preferable ratio of basic to applied research funding and the overall hurdles of aging research field. I found it quite interesting that mutations in multiple myeloma are located in the genes involved in NFkB pathway. This chain of events in the cell activates as a response to various kinds of stress, such as cytokines, free radicals, ultraviolet irradiation and other stressors. 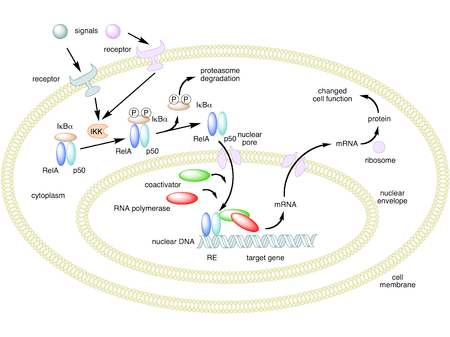 NFkB is a transcription factor which is responsible for activating genes linked to increased inflammation. Multiple myeloma genome sequencing revealed that this molecular pathway is altered. So apparently there’s a link between the aberrant activity of NFkB and cancer, and I would like to point out that there’s probably a link to aging as well. It is most likely that inhibition of this pathway may lead to cancer incidence reduction and also anti-aging effects. It has already been shown that pharmacological blocking of NFkB pathway prolongs lifespan in drosophila. Read the paper by Dr.Alexey Moskalev who’s done this experiment. 1. What are the mechanisms responsible for the differences in life expectancy within one species and between species? and increase the average and maximal life span in animals? 3. What is the relationship between aging and pathology? 4. At what stage of evolution did aging emerge? 5. How did the mechanisms of aging and anti-aging evolve? 6. What are the mechanisms of relationship between aging of an organism and aging on cellular level? 7. What is the reason for the existence of species with negligible aging? 8. How are reproduction and lifespan interrelated? 10. Why is there a decline in regenerative potential of an organism over time? 11. What is the role of epigenetic regulation during aging? 12. What is the role of inflammation in aging processes? 13. What is the role of genomic instability in aging processes? 14. What interventions in aging processes could extend the maximal lifespan of model animals and humans? 15. What is the effect of aging on the cells’ and organisms’ energy supplies and vica versa? 16. What is the role of the neuroendocrinal system in the regulation of aging processes? 17. What is the distinction of centenarians as compared to the whole population? 18. How relevant to humans are the results of life extension research on model animals? 19. What is essential for creating the unified synthetic theory of aging? 20. How did animals with negligible senescense evolve? 21. What are the factors influencing differences in the rate of aging among individuals? 22. What are the mechanisms of aging in cancer cells? 23. What is the relationship between aging and oncogenesis? 24. When does aging begin in humans? 25. When do manifestations of aging begin? 26. What are the molecular biological mechanisms of regeneration during sleep? 27. What is necessary for the creation of an exhaustive list of biomarkers of aging? 28. Can neurogenesis be stimulated? 29. What are the mechanisms of how higher nervous system activity influences the mechanisms of aging? 30. What are the factors defining the rate and efficiency of stress responses?